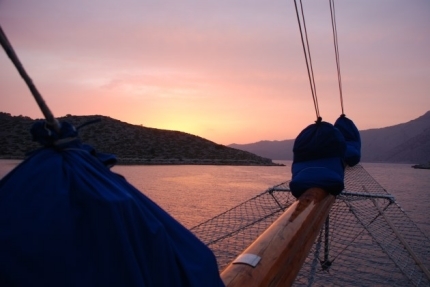 Spend one week discovering the Dodecanese Islands in the Southern Aegean. We begin our adventure in Bodrum, a Turkish seaside getaway, with an mysterious elegance, from the town's crowning castle and glittering marina to its flower-filled cafes and white-plastered backstreets. Even in the most hectic days of high summer, you can still find little corners of serenity in the town. Using the boat to explore the region, we continue to discover the excitement and tranquility of Rhodes, the towering volcanic crater in Nissiros, and the charming simplicity of Symi. Let yourself be transported back in time and experience the rich history of the Aegean. Relax while swimming in idyllic bays, enjoy the fabulous vistas, and walk in the footsteps of a turbulent, glorious past. Let us take you to the ancient Asclipion where Hippocrates, the famous physician, practiced his art. Enjoy the peaceful and lovely island of Lipsi and dive into the atmosphere of the holy island of Patmos, once voted at Europe’s best places to live.